Vyshakh V Babji is a summer intern in the lab who is currently working on The Cure. He is a graduate student from the Department of Computer Science at San Diego State University. 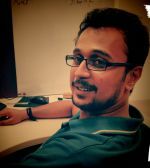 Vyshakh has previously worked as a systems engineer at Infosys Technologies Limited (Bangalore, India), and has been a software developer intern at Bharath Sanchar Nigam Limited (Bangalore, India). He has experience in Java development for an Ecommerce website, web app development, and android app development.